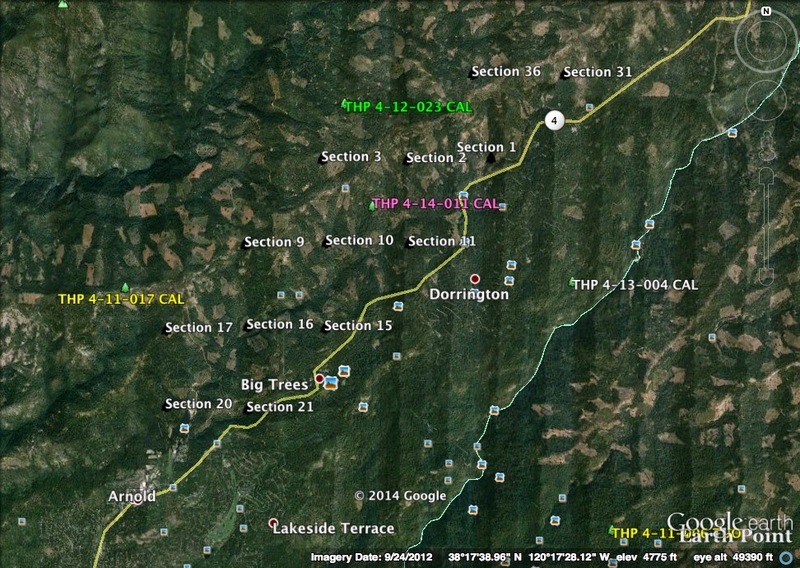 This THP is just north of Dorrington, CA and Highway 4 running west towards Arnold and east towards Cottage Springs. Although not disclosed within THP documents, it is also close to the northern boundary of Calaveras Big Trees State Park. Sierra Pacific Industries is planning a mostly clearcut tractor based logging operation in ponderosa pine, sugar pine, white fir, Douglas fir and incense cedar forests at an elevation of 3,900 to 6,000 feet. 5,950 feet of seasonal road construction and road re-construction is planned, and 103 acres of so called "operational buffers" will be placed around units for fire line construction, skid trails, landings and tail holds. Sierra Pacific Industries also wants to use excavators for fire line construction on slopes less than 50%, and on slopes less than 30% that lead without flattening into a class II watercourse. There are 12 road drainage sites planned for work including rocking, dip construction and culvert repair and replacement. A historic 1952/1953 Sierra Nevada Yellow Legged Frog sighting lies within 150 feet of the THP area. More information is available on the THP Tracking Center website.